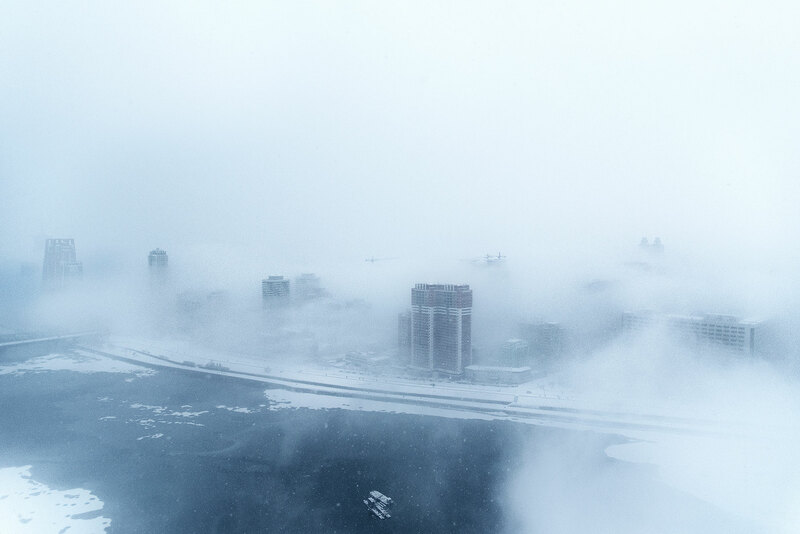 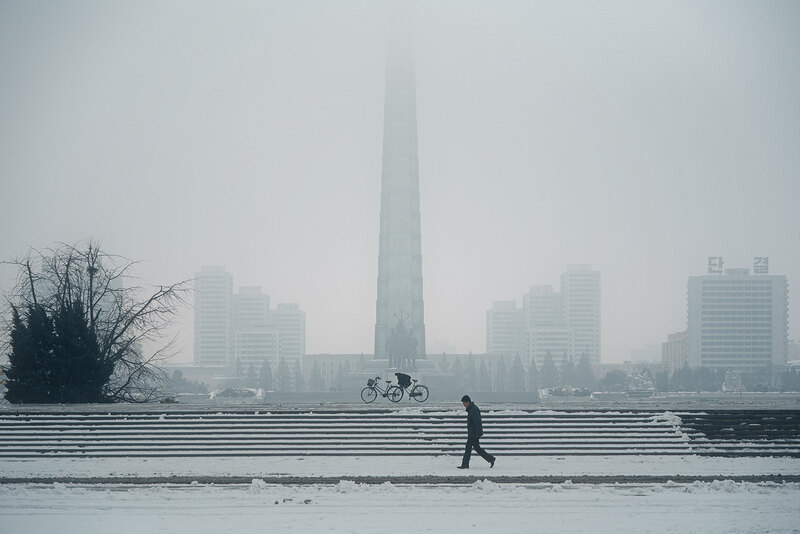 December Kingdom: Storm whorls churn through the streets of central Pyongyang. 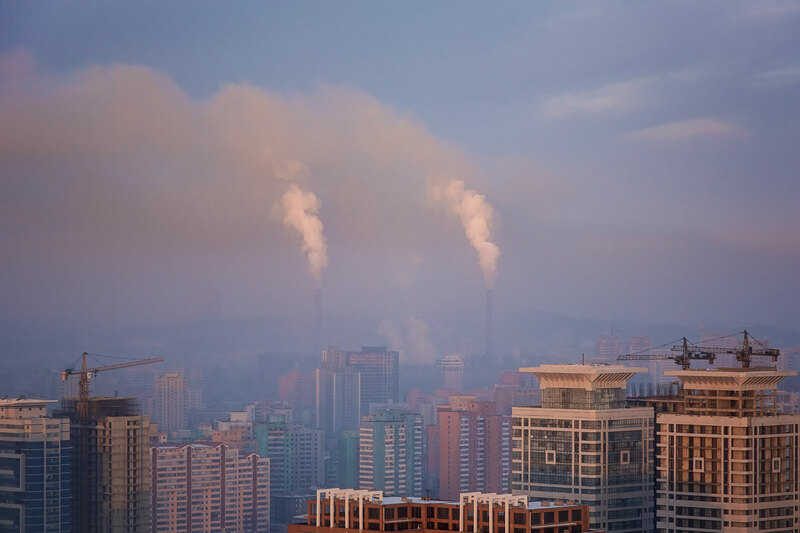 Skyward Tailpipes: Exhaust from a coal power plant billows into atmosphere in west Pyongyang. 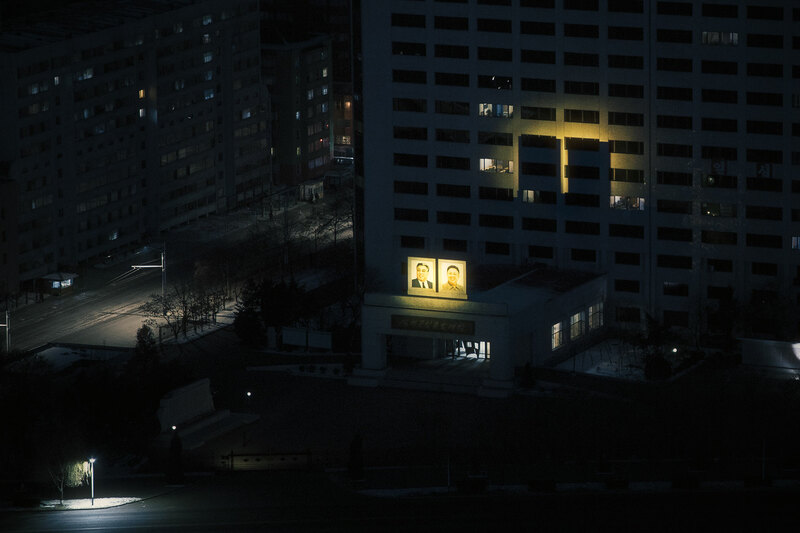 At 0.46 megawatt hours per capita, power consumption in North Korea is less than one-twentieth of that in neighbouring South Korea, with an estimated one in three North Koreans having access to electricity. 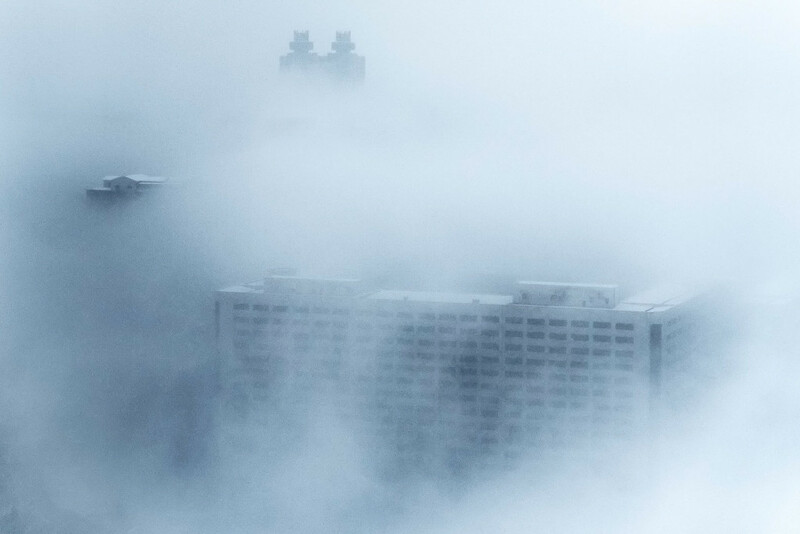 Jenga Symmetry: Bric-a-brac apartment towers sprawl eastward in an imprecise mirror. 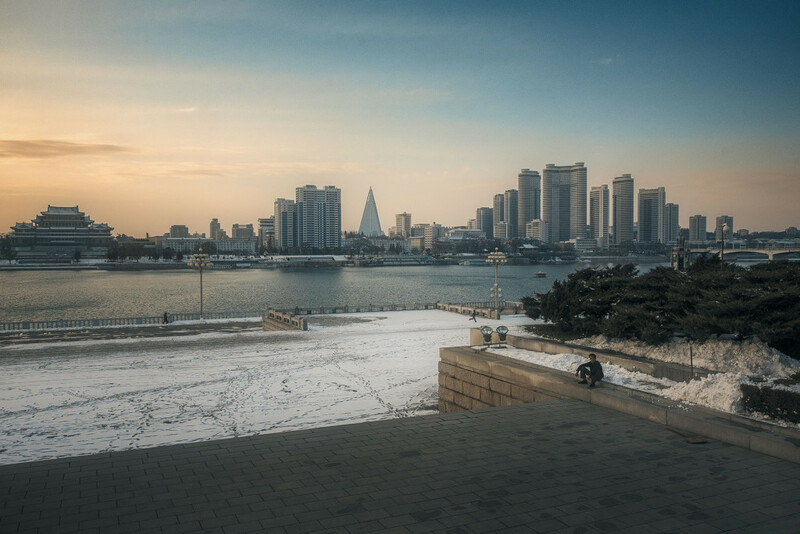 Winged Formation: Older modernist-socialist block flats contrast with the new towers of Future Scientists Street, a posh development built in 2015 to house the scientific institutions of Kim Chaek University of Technology and their employees. 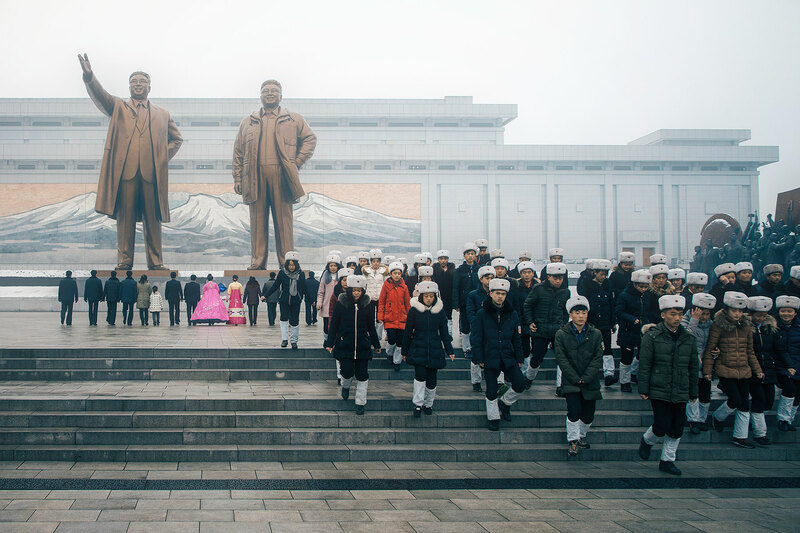 The Angels’ Dream of Unity: Thirty metre-tall stone women hold a map of the Korean Peninsula built to commemorate the proposals put forward by President Kim Il-Sung for Korean reunification. 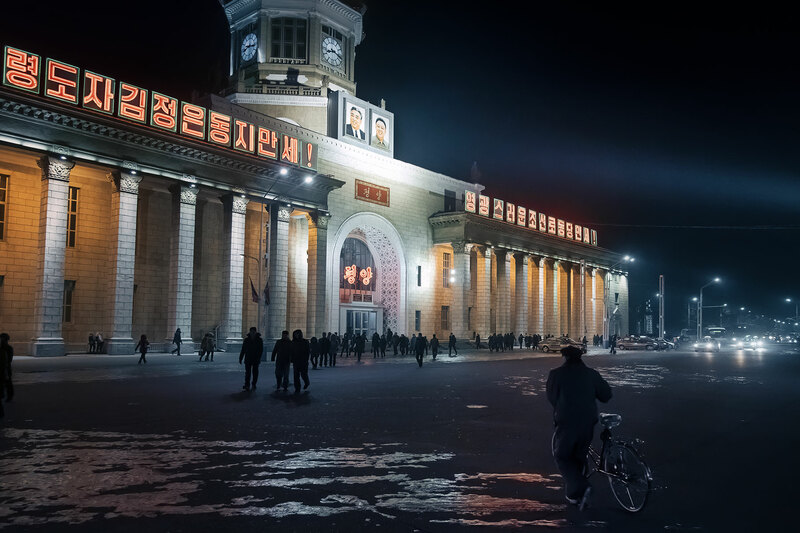 Siren Call: A lone commuter crosses Kim Il-Sung Square after dark. 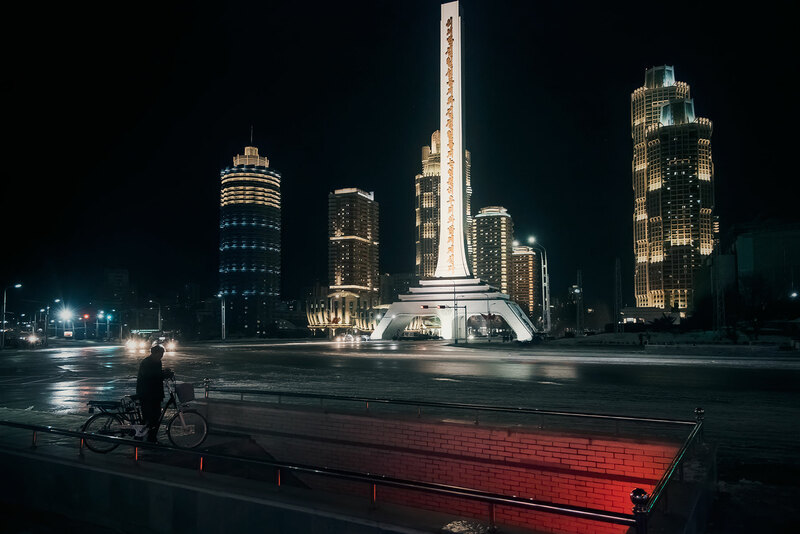 Behold, Eternal Life: A cyclist dismounts at the mouth of an underpass near Pyongyang’s skyscraping Tower of Immortality. 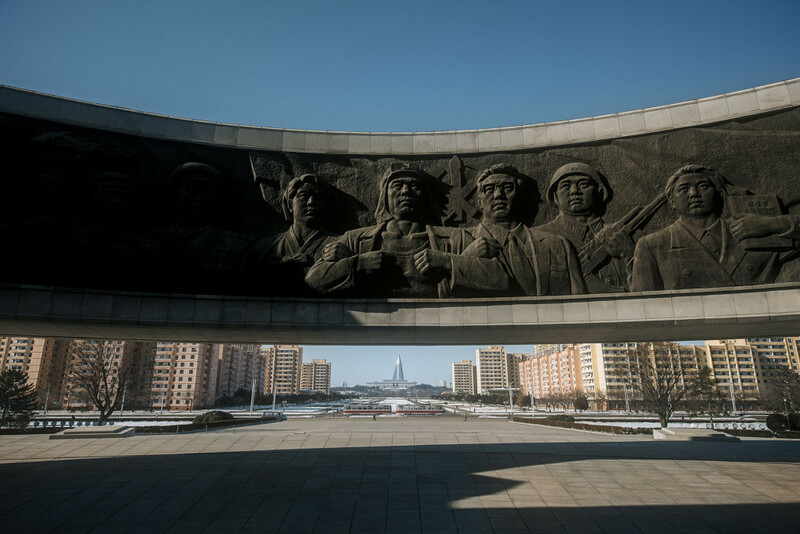 Fixtures of towns and villages throughout the nation, these obelisks serve as reminders to North Koreans that their departed leaders Kim Il-Sung and Kim Jong-il will always be with them. 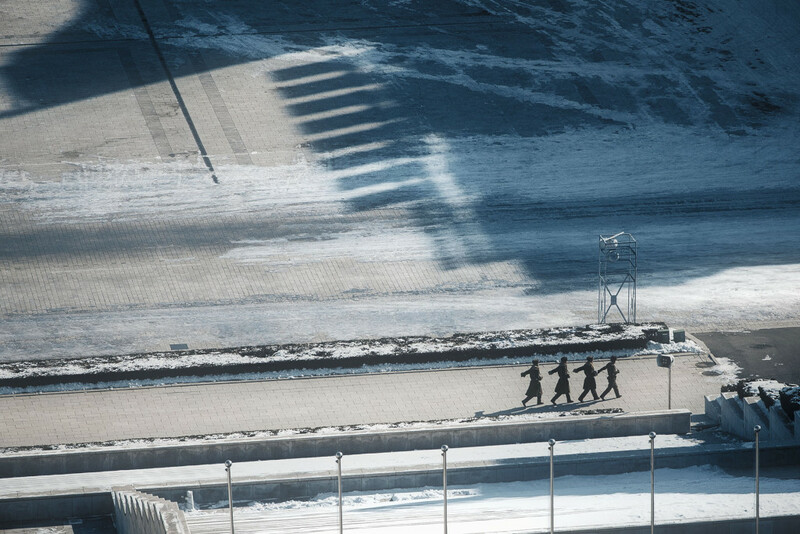 The Space Between Leaders: The departed leaders cast long shadows across an apartment tower in central Pyongyang. 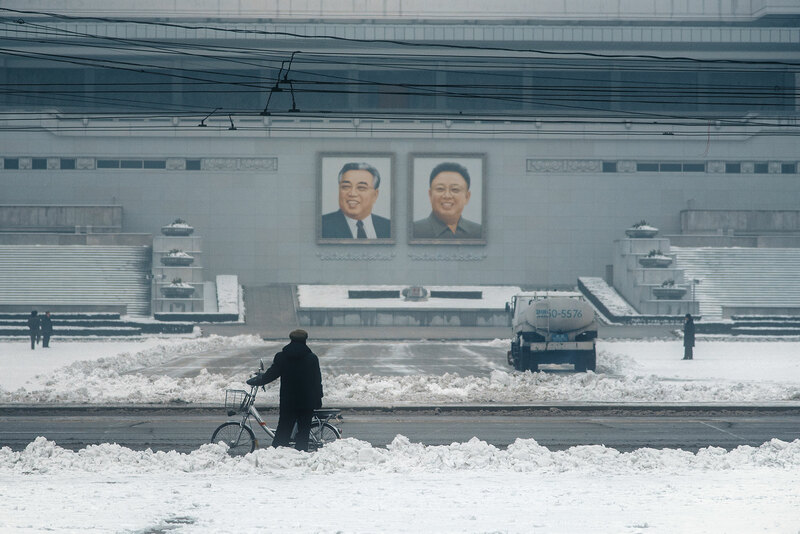 By law, the Kims’ portraits must hang in every home, office, school and public place in the country. 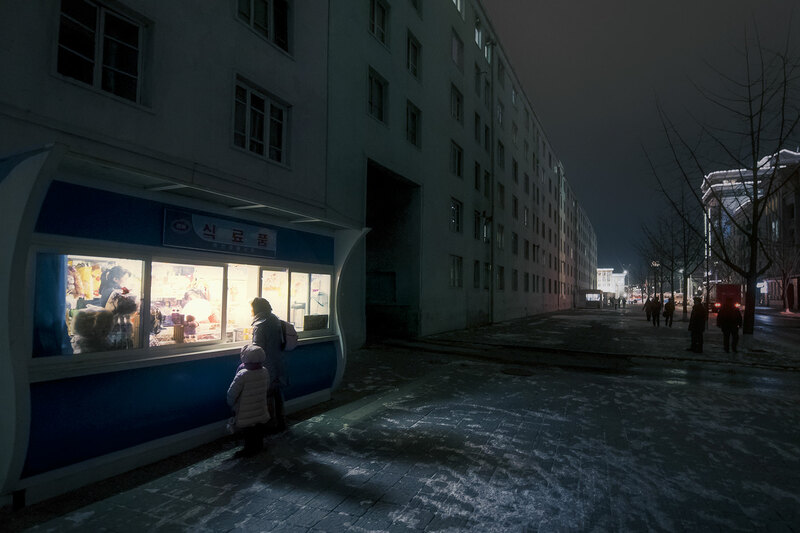 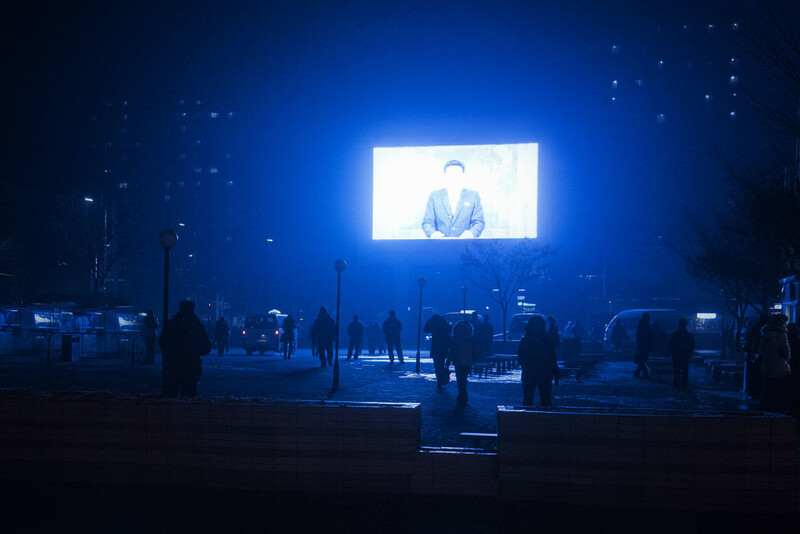 The Party Line I: State news beams out across a public square on a subzero December night in central Pyongyang. 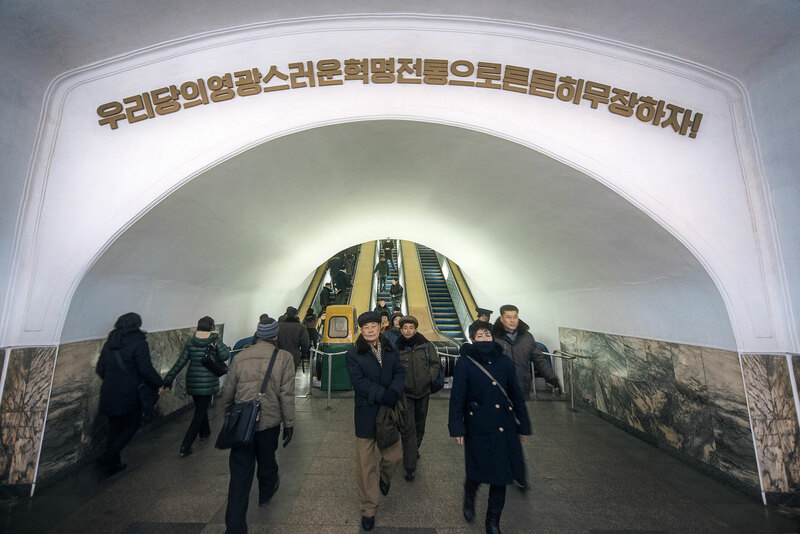 Gateway to a Nation: Transiting silhouettes frame a view of Pyongyang Station. 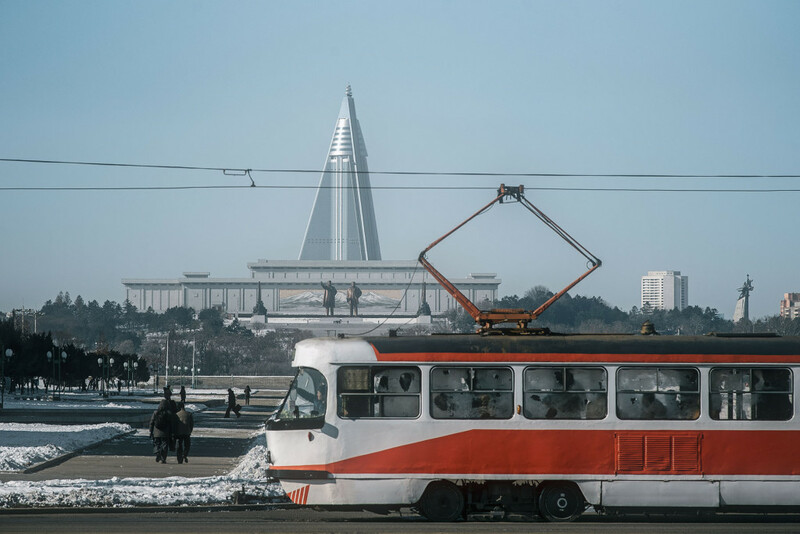 Totalitropolis: Viewed from across the Taedong River, the pyramid-shaped outline of the Ryugyong Hotel (centre) and the 600-room Grand People’s Study House (left) dominate the skyline of modern Pyongyang. 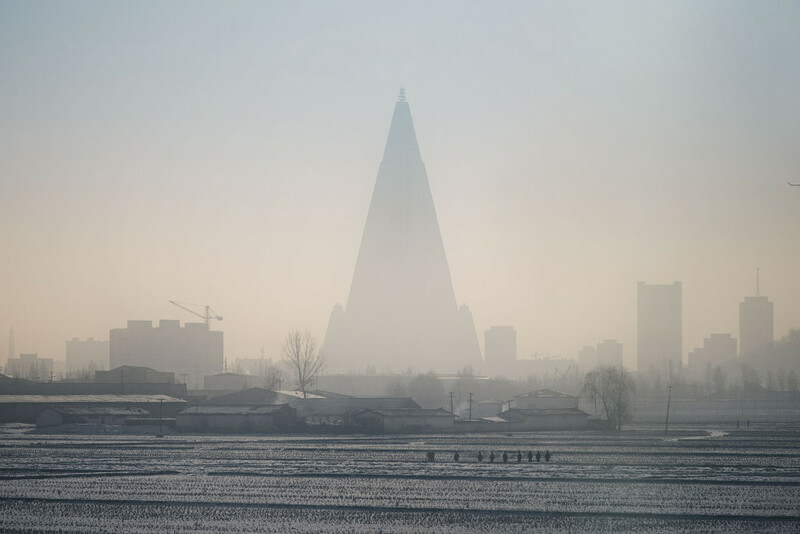 Blue Sky Camouflage: When construction began on the 330 metre Ryugyong Hotel in 1987, the 105 storey building was on its way to becoming the tallest building in the world outside the United States. 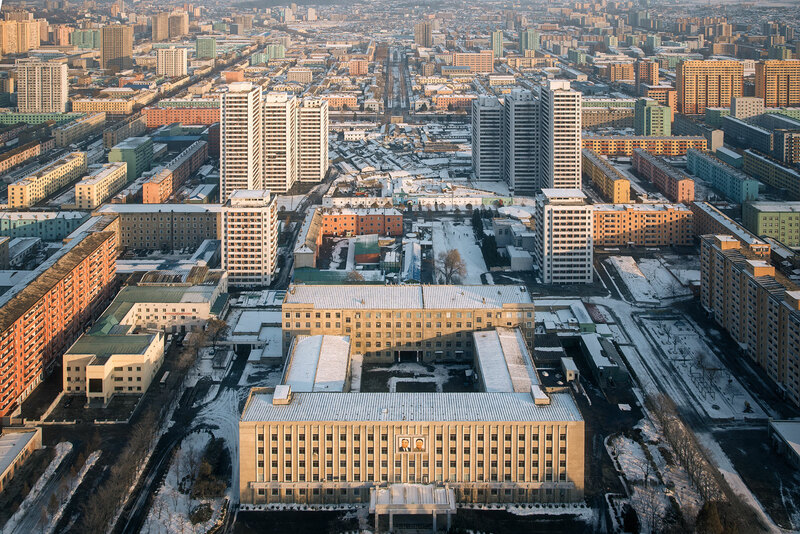 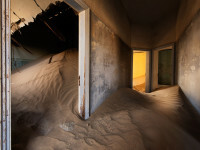 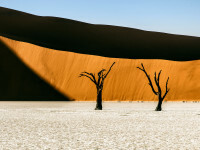 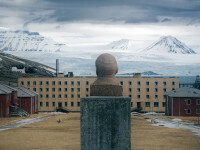 Thirty years later, the building that Esquire magazine once dubbed “the worst building in the history of mankind” is still unfinished and unoccupied. 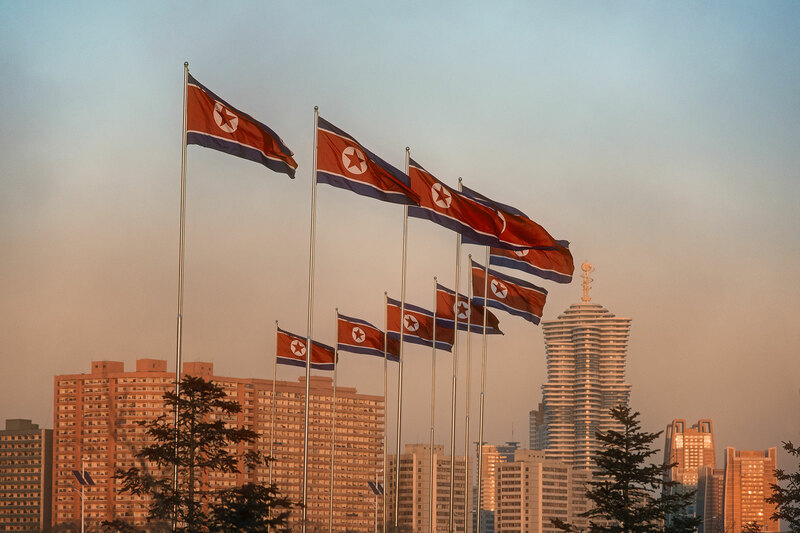 Pillar of Self-Reliance: The Juche Tower disappears into cloud high over East Pyongyang. 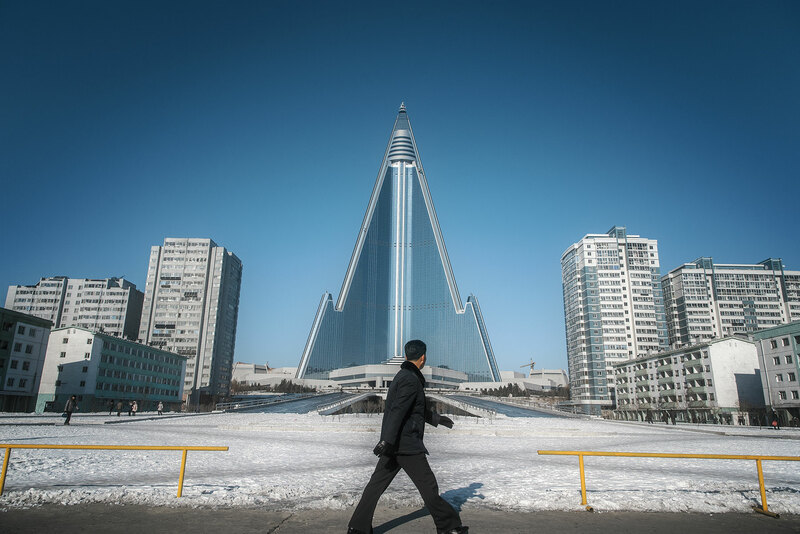 Named for North Korea’s ideological policy of economic self-reliance, the tower is reminiscent in design and significance to the Washington Monument, which it surpasses in height by just one metre. The obelisk is the world’s tallest stone structure. Alloy Likeness: A group of students make way for a wedding party arriving to pay their respects to North Korea’s departed leaders. 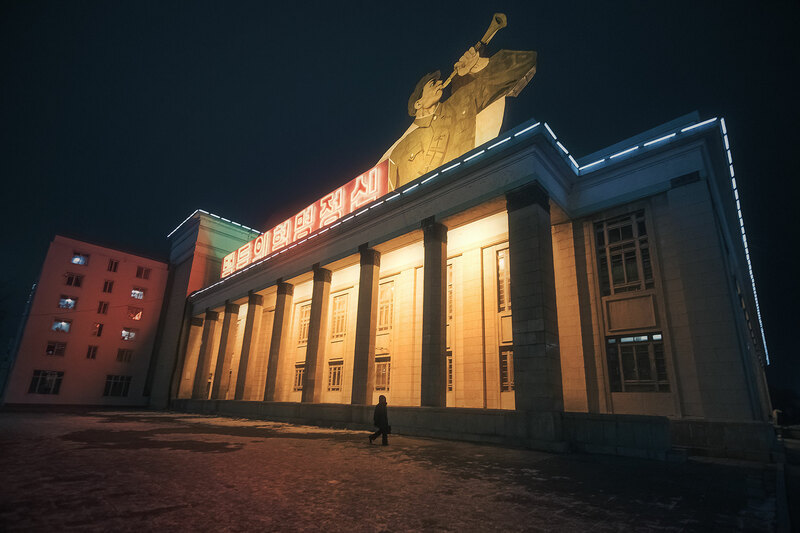 Overhauled after the 2011 death of Kim Jong-il, Pyongyang’s Mansudae Grand Monument is among the most sacred sites in North Korea. 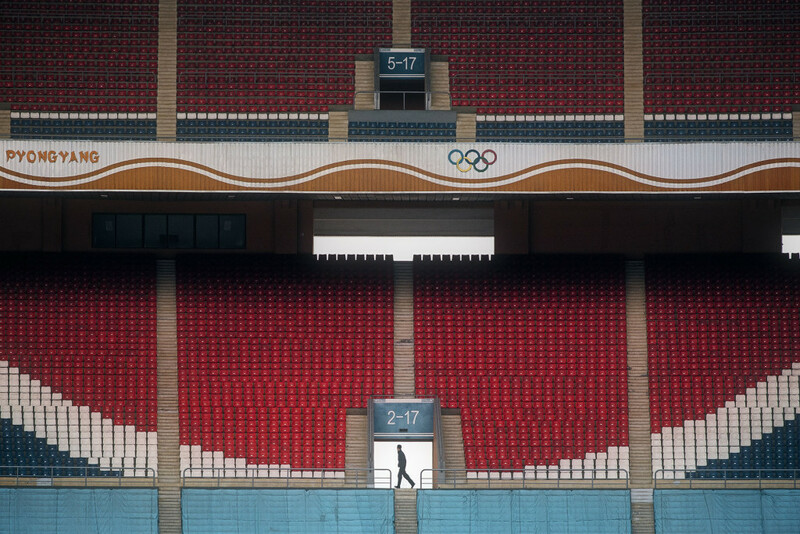 Team Colours: Stands carve out the North Korean flag at May Day Stadium, by capacity the largest stadium in the world with 114,000 seats. 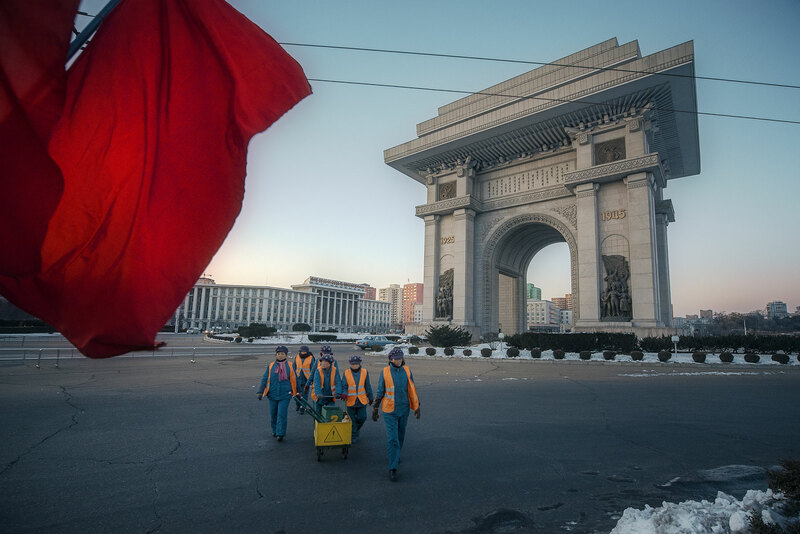 Of Triumph and Toil: Pyongyang’s 60-metre Arch of Triumph looms over a traffic circle. 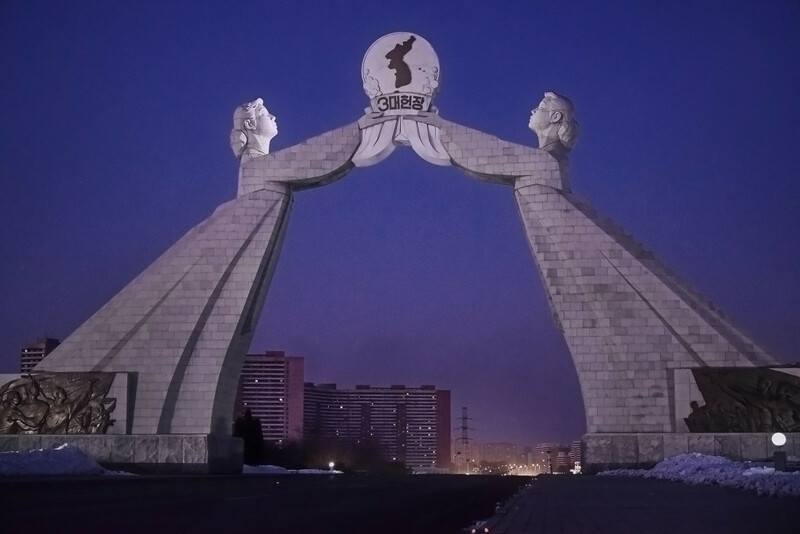 In a country starved for electricity, the arch has its own dedicated diesel generator so it can remain illuminated in case of power failure. Czechoslovakian Aerodynamics: A 1960s-vintage tramcar, enjoying a second life after retirement from service in the Eastern Bloc, runs commuters across Pyongyang as bronze statues of Kim Il-Sung and Kim Jong-il look out from across the Taedong River. 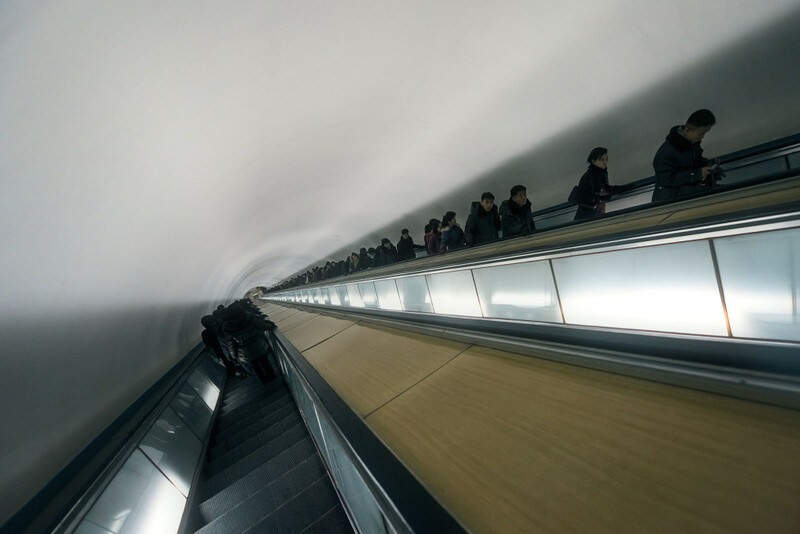 Belts to the Underworld: A 110-metre deep escalator whisks commuters to and from their trains in three-and-a-half minutes. The Pyongyang Metro is the deepest system in the world. Subterranean Cathedral: Commuters file into Pyongyang’s cavernous Yŏnggwang Station as an eastbound train departs. 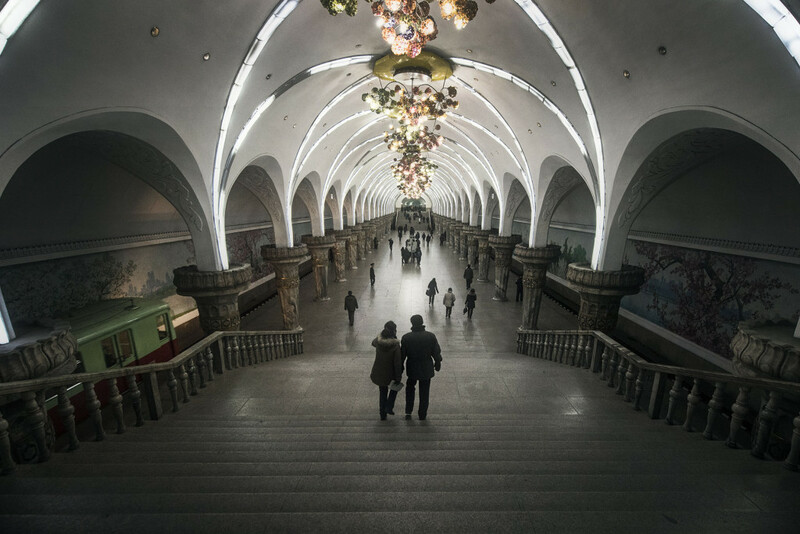 The depth of the metro system allows its stations to double as bomb shelters, with blast doors in place at hallways. 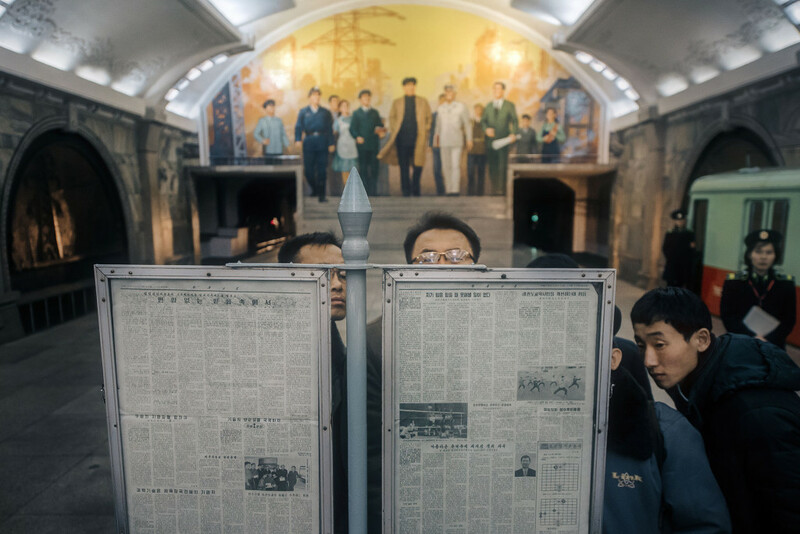 The Party Line II: Commuters angle for a view of the day’s state newspaper while they wait for their trains. 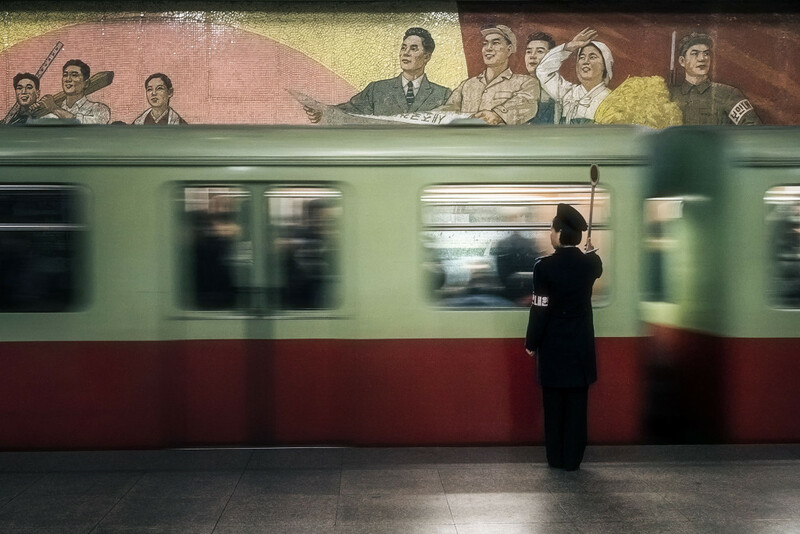 Clearance Height: Carriages sail past a propaganda mosaic. 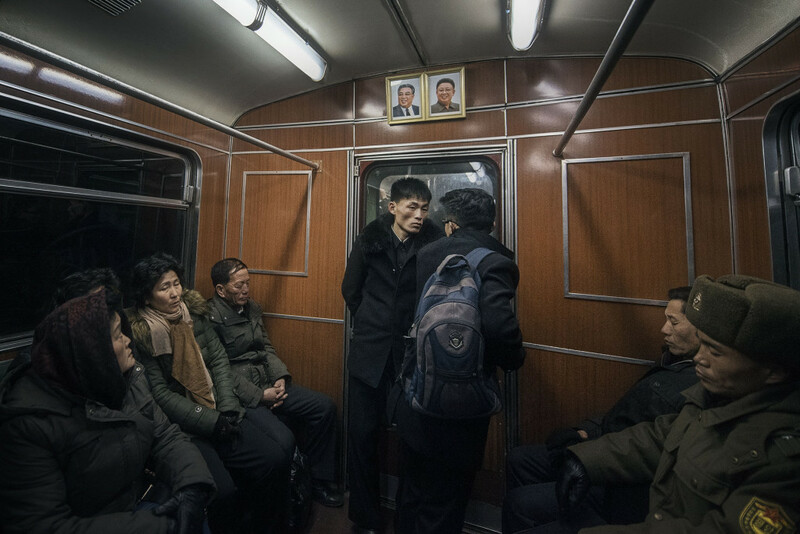 Most rolling stock on Pyongyang’s metro system was built for post-war East Germany, although there is a plan to replace these carriages with North Korean built one in the coming years. 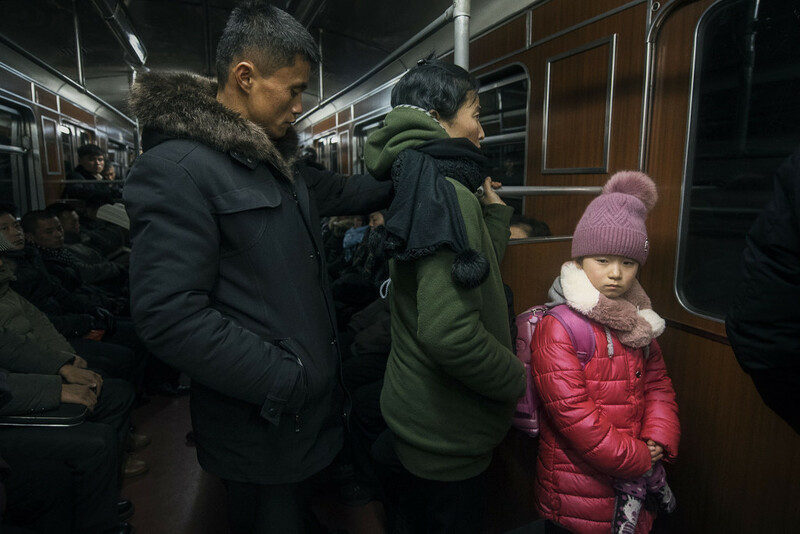 A Story of Parkas: A middle-class family ride the metro under central Pyongyang. 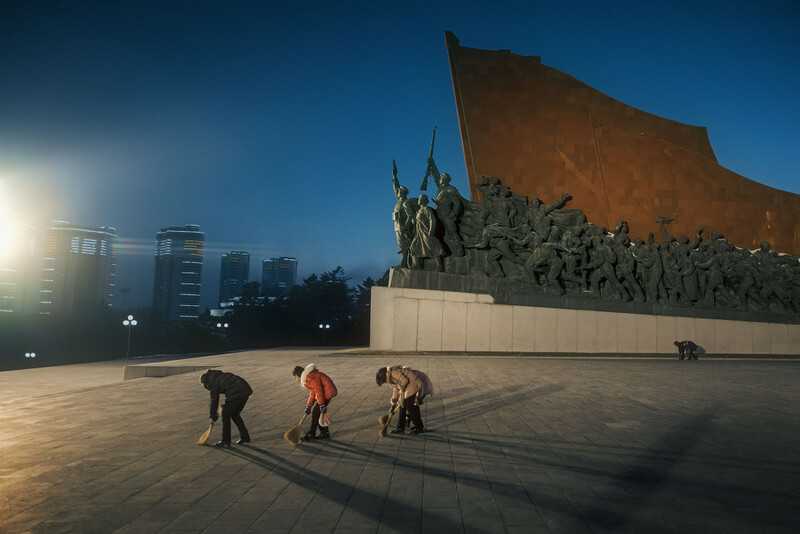 Street Team I: Flanks of schoolchildren clean the plaza around the Mansudae Grand Monument. This ritual of civic duty plays out twice every day, at dawn and dusk. 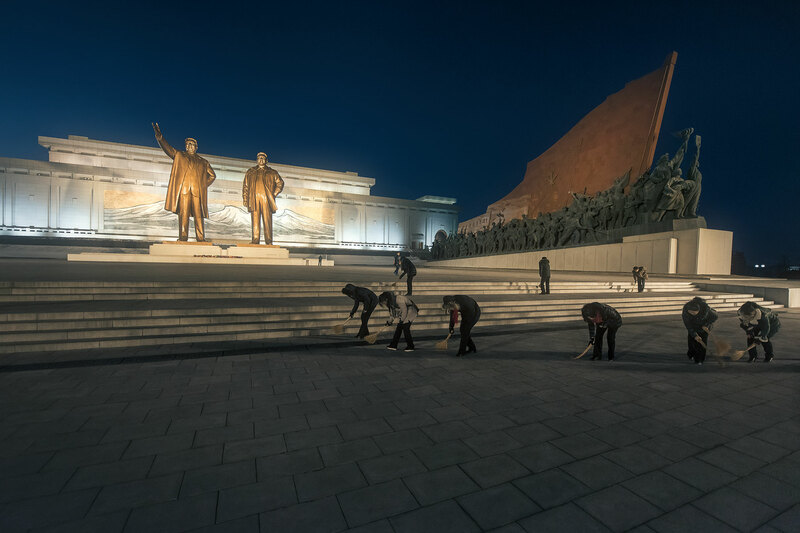 Street Team III: Schoolchildren clean the public square against the skyline of Chongjon Street, an 18-tower complex dubbed “Pyonghattan” and built for privileged state workers to commemorate the 100th anniversary of Kim Il-Sung’s birth. 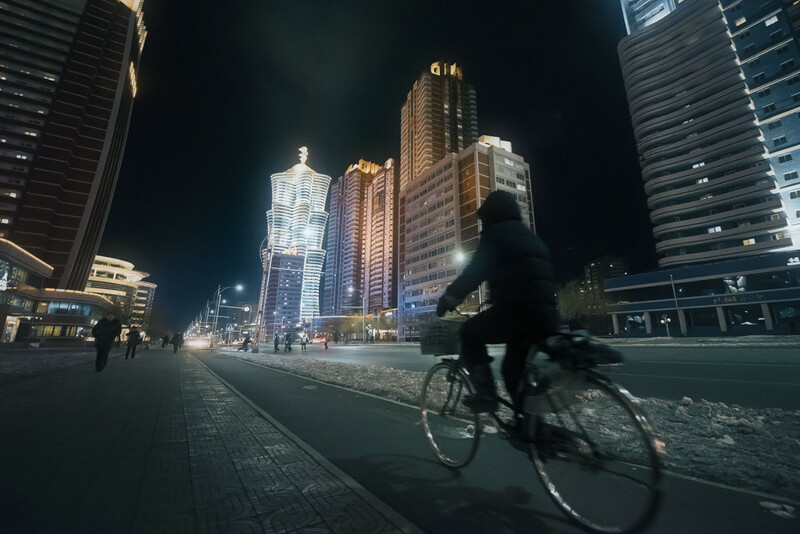 Boulevard of the Atoms: A man cycles along the pastel-hued Future Scientists Street. 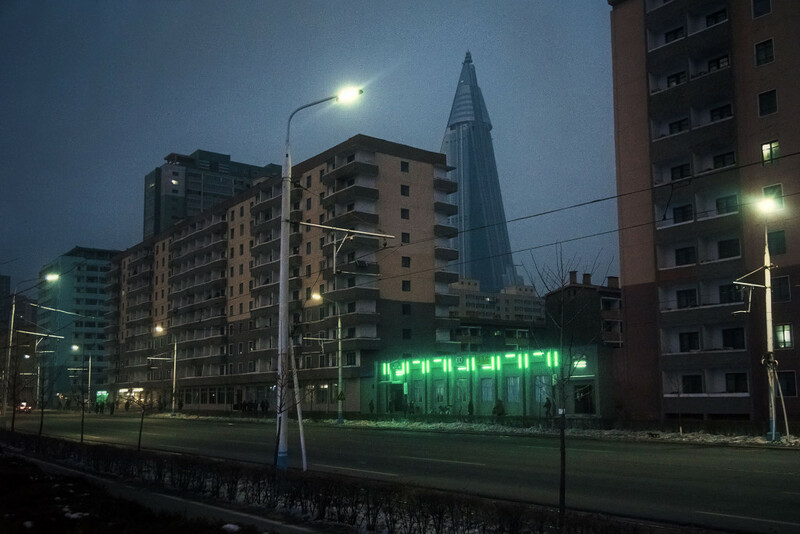 Mirae Unha Tower, a 53-storey skyscraper shaped to resemble an atom from above, looms in the distance. 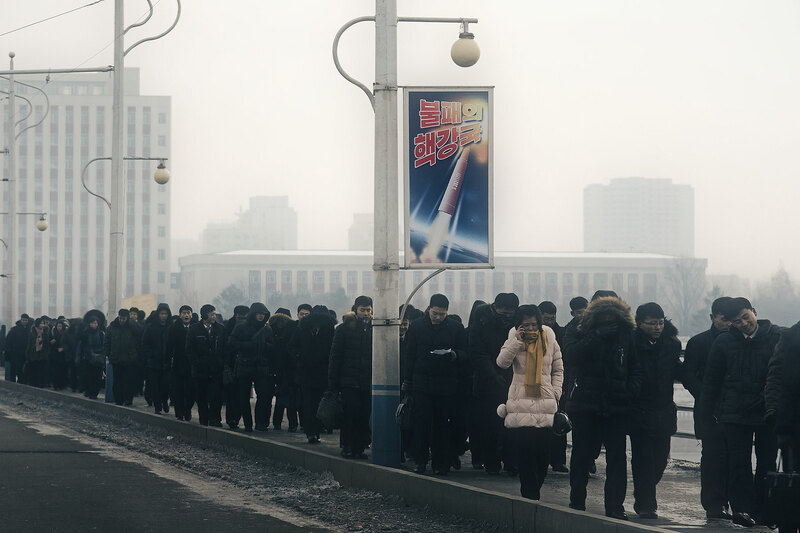 Single Heart Unity: Crowds stream across Okryu Bridge from a medal ceremony held to fete the nuclear scientists who engineered a successful intercontinental ballistic missile (ICBM) launch weeks earlier. 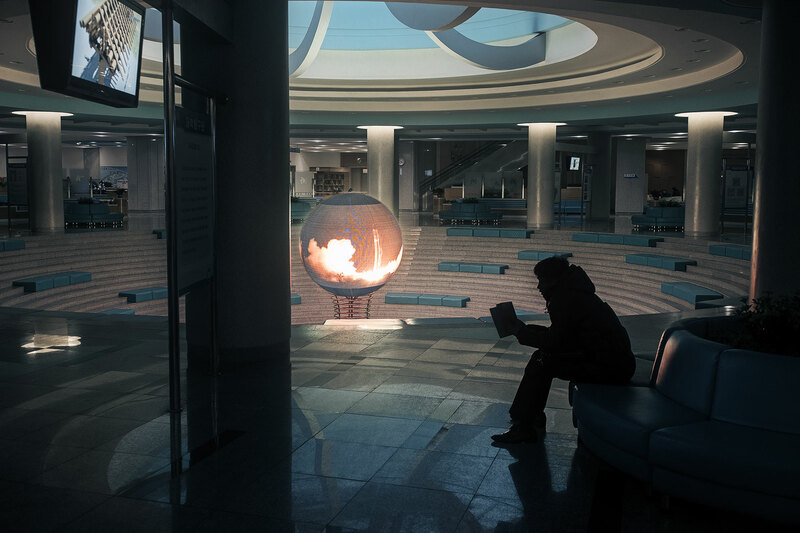 Launch Sequence: A silhouette reads in front of an orb projection displaying a loop of rocket launches in Pyongyang’s Sci-Tech research centre. 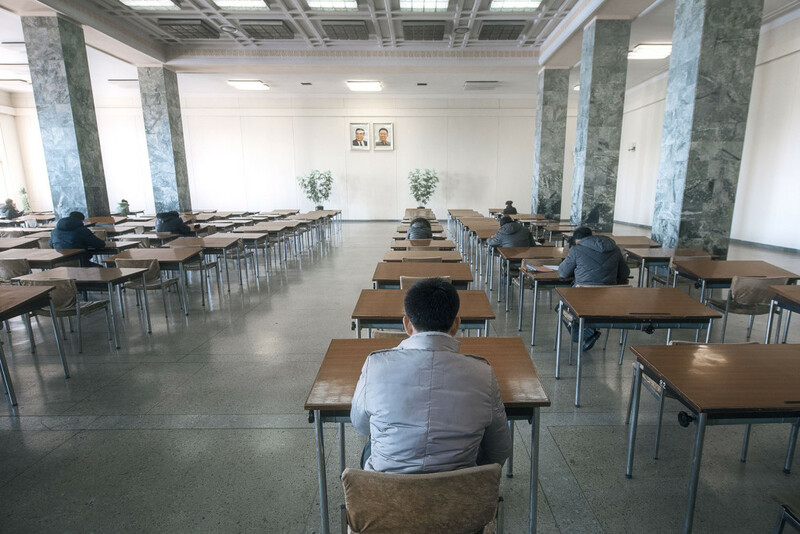 Between Two Ferns: The departed leaders watch over a study hall at the Grand People’s Study House. Bench Conference: A gaggle of schoolgirls jostle for position and balance on a lace-up bench during a field trip to a skating rink in East Pyongyang. 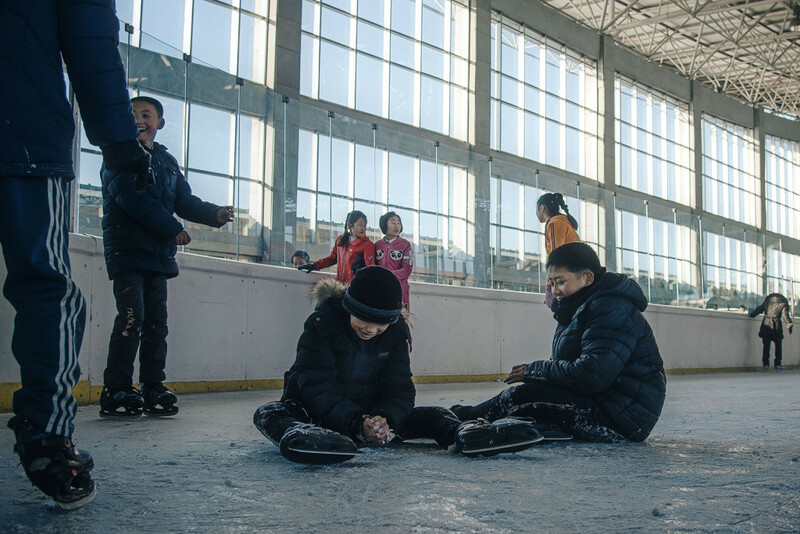 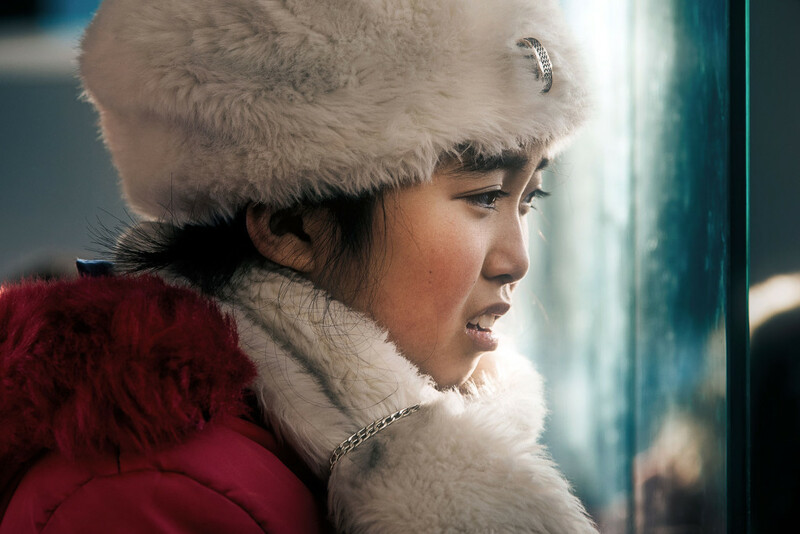 Spectator Sport: A parka-clad girl watches her classmates from the boards at a skating rink in East Pyongyang. 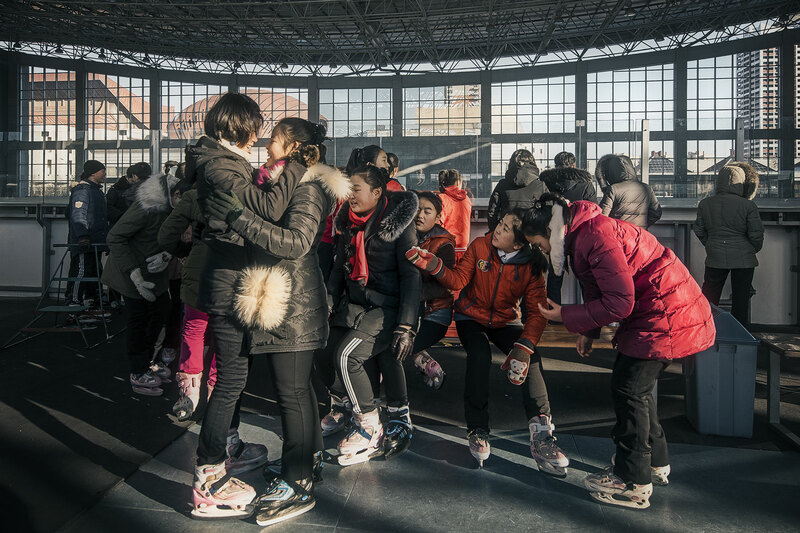 Shaved Ice: Boys make pellet-sized snowballs from the hacked-up ice surface of a skating rink in East Pyongyang. 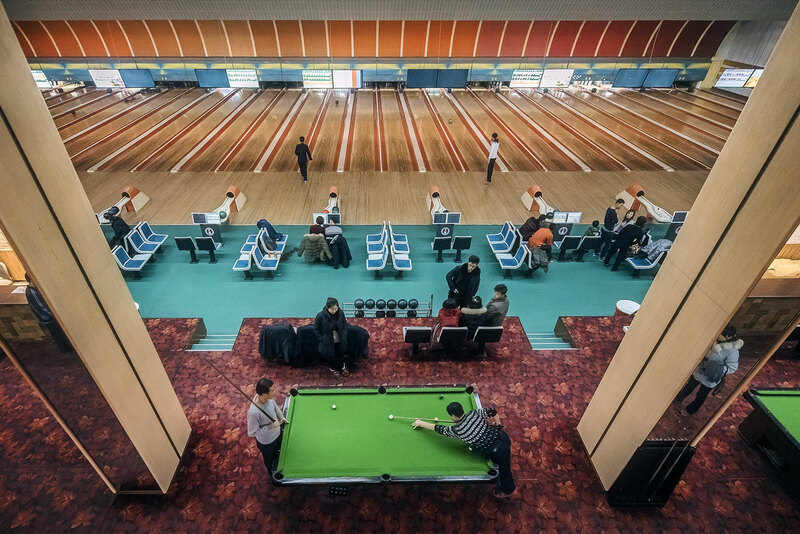 Sinking Stripes / Knocking Strikes: The last stages of a pool game play out against a soundtrack of strikes, spares and gutter balls at a bowling alley.